Protecting your privacy and the confidentiality of your personal information has always been an important aspect of LAWPRO’s operations. As a provider of insurance products and related services, the collection and use of customers’ personal information is fundamental to our day-to-day business operations. In fact, an insurance company’s most important asset is its information. We strive to provide you with the best customer service. To us, that includes treating your personal information fairly and with respect. Each LAWPRO employee and representative must abide by our commitment to privacy in the handling of personal information. LAWPRO is also concerned about the personal information of its employees and representatives. LAWPRO’s Privacy Code informs you of our commitment to, and policy on, privacy. It tells you the ways we ensure that your privacy and the confidentiality of your personal information are protected. In this Code, “we”, “us” and “our” means Lawyers’ Professional Indemnity Company (LAWPRO), which includes the TitlePLUS and practicePRO programs. “You” and “your” means the individual who is a customer or potential customer of LAWPRO. In other words, our Privacy Code applies to protect the personal information, in our possession and control, of lawyers we insure or have insured, all TitlePLUS policyholders and all users of the LAWPRO, TitlePLUS, and practicePRO web sites. However, this Code does not apply to personal information collected, used or disclosed by LAWPRO for the purpose of operating the mandatory professional liability program for the Law Society of Ontario or any other law society from time to time. Our websites may contain links to other websites that are provided and maintained exclusively by third parties. Websites provided and maintained by third parties are not subject to this Privacy Code. Please review the privacy policies on those websites to determine their information handling practices. Personal information is any piece of information, either factual or subjective, about an identifiable individual. At LAWPRO, we take our commitment to securing your privacy very seriously. Each employee and representative of LAWPRO is responsible for the personal information under their control. Our employees are informed about the importance of privacy and receive information periodically to update them about our Privacy Code and related policies. Whenever we collect information or establish a file about you, we will explain the purpose and how we intend to use the personal information we collect. We will do this either at that time of collecting personal information or earlier. We will limit the information we collect to what we need for those purposes, and we will use it only for those purposes. We will obtain your consent if we wish to use your information for any other purpose. We ask you for information and create and maintain a file about you to establish a relationship and serve you as your insurer. We obtain most of our information about you directly from you, or as required, from the Law Society of Ontario. In some cases, information may be obtained from an authorized representative, such as your lawyer, or a law firm managing partner or administrator. administer our insurance programs properly, including the handling and resolution of claims. We seek and confirm your consent to collect, use and disclose your personal information at the time of collection or in advance. We will endeavour to employ clear, understandable language when we obtain your consent. Consent may be expressed in writing or implied, and in some cases, you may provide it verbally, electronically or through your authorized representative, such as your lawyer. Written consent includes completing and signing an application for insurance or another LAWPRO product. Implied consent may be found where you choose to use a LAWPRO product or service, such as one of our websites, or proceed with the purchase of coverage after explanation of the relevant terms. All electronic communication (“e-mail”) with you that is not essential to participation in a LAWPRO program includes a straightforward “opt-out” feature that allows you to request that we cease e-mail communication with you. Not responding to our offer to have your name removed from the e-mail list is another form of implied consent. where there is a claim against a LAWPRO policyholder, there is usually a legal duty on us to defend that policyholder’s interests. In order to fulfill that obligation, we must collect, use and disclose relevant personal information about third parties involved in the claim, even though the third parties have not given consent. The choice to provide us with personal information is always yours. Upon request, we will explain your options of refusing or withdrawing consent to the collection, use and release of your information, and we will record and respect your written choices. However, your decision to withhold particular details may limit the services we are able to offer, whether at the time of application for insurance or at a later date, such as upon receipt of a claim. In particular, once you have been granted insurance coverage, your ability to withdraw consent may be severely limited even if you wish to forfeit coverage. This measure is necessary to protect the integrity of the insurance programs operated by LAWPRO. Furthermore, any refusing or withdrawing of consent is always subject to any overriding legal requirements or commitments. Information is not collected by LAWPRO without a specific, limited requirement. We collect information by fair and lawful means. LAWPRO may collect some non-personal information from time to time for underwriting purposes. However, any adverse information would be disclosed to you or to your lawyer prior to any underwriting decision being made. When you visit our websites, information is not collected that could identify you personally unless you choose to provide it. You are welcome to browse these sites at any time anonymously and privately, without revealing any personal information about yourself. When you telephone LAWPRO, we may see your name on a “call display” feature. If you do not wish us to see your name, please contact your communication provider for instructions on blocking your identification from appearing, or call us from a telephone number not associated with you. The insurance file we establish and maintain about you and the information we request from you is used/disclosed for the purposes defined. We will seek your consent before using or disclosing the information in the file for purposes beyond the scope of your original consent unless required/permitted by law. Under no circumstances do we sell customer lists or other personal information to third parties for marketing purposes. LAWPRO’s policy is to use personal information only to forward communications necessary or appropriate to the fulfillment of our obligations as an insurer, which may include related insurance and risk management information. However, if you obtained one of our products through an insurance intermediary, that intermediary may use your information for marketing or other purposes as permitted by applicable law. You should consult the intermediary about its personal information practices. There are some unavoidable types of disclosure of your personal information which may occur occasionally as part of LAWPRO fulfilling its routine obligations and/or conducting its business in the ordinary course. This includes disclosure to, for example, partners, consultants and suppliers to LAWPRO (also known collectively as “service providers”), assuming that they are abiding by LAWPRO’s Privacy Code (or their own code that provides generally equivalent protection) and only to the extent necessary to allow them to provide business services or support to LAWPRO, including technology, banking, financial, auditing, accounting, legal and insurance services. We will retain your information only for the time it is required for the purposes we describe and as permitted by applicable law. Once your personal information is no longer required, it will be destroyed or made anonymous. However, due to LAWPRO’s ongoing exposure to potential claims and need for actuarial analysis, most information collected and aggregated is kept indefinitely. In addition, some personal information may be retained indefinitely because it is inseparable from records with historical or archival value. We regularly cross-check our name and address information for lawyers and other professionals with the Law Society of Ontario and other relevant provincial licensing bodies in the jurisdictions where we carry on business. We encourage our customers to review and confirm the accuracy of information provided. If you find any errors in this information, we urge you to contact us as soon as possible (by phone, fax, mail, e-mail, or Internet), and we will make the appropriate corrections immediately, upon receipt of appropriate evidence. We will protect your information with appropriate safeguards and security measures, such as LAWPRO’s computer usage and security policies. Internal and external audits of our procedures and security measures are conducted regularly to ensure that they are being properly administered and that they remain effective and appropriate. LAWPRO maintains personal information in a combination of paper and electronic media. With respect to our business generally, recent paper records concerning individuals’ personal information are stored in files kept onsite at our Toronto head office. More specifically with respect to our business conducted in the Province of Québec, your file can be accessed at the offices of LAWPRO’s insurance representative. For current contact information, please visit [www.lawpro.ca/quebecrepresentative]. Older records containing individuals’ personal information may be stored at an offsite storage facility. Access to personal information will be authorized only for LAWPRO’s employees, representatives and service providers who require access in the performance of their duties, to any person granted access by the individual through the consent process and to those otherwise authorized by law. When providing information to service providers acting on our behalf, we will require such organizations or individuals to abide by our Privacy Code or to have their own code which gives generally equivalent protection. We will give them only the information necessary to perform the services for which they are engaged, and will require that they not store, analyze or use that information for purposes other than to carry out those services. LAWPRO’s computer systems, including portions of our websites, are password-secured and constructed in such a way that only authorized individuals can access secure systems and databases. To safeguard against unauthorized access to your personal information via the Internet, you are required to “sign on” to certain secure areas of LAWPRO websites using an individual, confidential password. Passwords to the LAWPRO family of websites are provided only upon verbal confirmation directly with the LSO member or by use of an electronic system which contains identity verification processes. Generic passwords are only employed where there is no confidential information being displayed on the screen by LAWPRO. If you send us an e-mail message that includes personal information (such as your name included in the “address”), we will use that information to respond to your inquiry. Please remember that e-mail is not necessarily secure against interception. If your communication is very sensitive, or includes information such as your bank account or credit card number, you should not send it electronically unless the e-mail is encrypted or your browser indicates that the access to our website is secure. 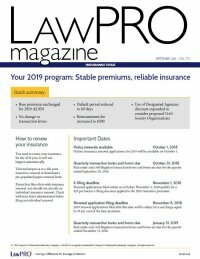 To review the LAWPRO Security Policy, please click here. LAWPRO has prepared this plain-language Privacy Code to keep you informed. It is made available to the public, in paper form from the address set out below and in PDF form. to whom it may have been disclosed, except where such disclosure was to a governmental body or service provider to LAWPRO for routine purposes. This would include, for example, auditors, reinsurers and accountants acting for LAWPRO. If you find any errors in this information, we urge you to contact us as soon as possible, and we will make the appropriate corrections immediately, based on the receipt of satisfactory evidence. LAWPRO encourages you to contact us with any questions or concerns you might have about your privacy or our Privacy Code. We will investigate and respond to your concerns about any aspect of our handling of your information. If, after contacting LAWPRO Customer Service, you feel that your concerns have not been addressed satisfactorily, please contact the LAWPRO Chief Privacy Officer at 416-598-5800, [email protected], or by mail at the above address. Please be sure to include your name, address, preferred method of communication, the nature of your complaint, and relevant details, including your past communications with us.